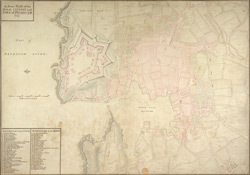 A plan of the town, citadel, dock, and country round Plymouth. Located in the south western peninsula of England, Plymouth Harbour commands the western approaches to the island and by the 16th century had become the country’s most important naval seaport. The citadel was built on the Hoe- the name means ‘high ground’ and it was the highest point in the area, in 1670. It was built in 1662 for Charles II as a fortress against the local Parliamentarians. In 1690 the first Royal Dockyard opened on the banks of the Tamar to the west of Plymouth. Further docks were built in 1727, 1762 and 1793, and a huge naval complex was later established here.